1952 Ohio Registration Sticker Cars - $20.00 : Bob Hoyts Classic Inspection Stickers, Add a Final Touch to your Restoration! This amazing 1952 Ohio sticker is completely different from any other stickers. This sticker was issued to Ohio cars, also trucks, and farm trucks which were even different. These stickers were issued because there were no Ohio plates issued in 1952 because of the Korean war and shortage of metal. Vehicles had to be inspected before registration stickers were issued. The regular sticker for 1952 passenger cars would be blue. Farm Trucks were green and regular trucks were a redish/ yellow color. This sticker is priced at $20.00 but would come with blank panels. 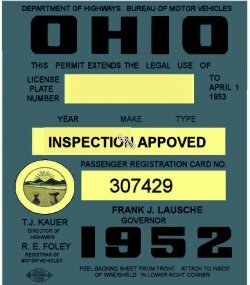 Ohio issued one also in 1943 to validate 1942 license plates. Ohio did and does today, have a spot check program and car dealers issued the safety check stickers as far back as 1946. This sticker was originally a water slide sticker but ours has our "Peel and Stick" feature that allows you to attach it to the inside passenger side of your windshield. This Ohio sticker was carefully restored keeping true in color and size to the original. This blue sticker was the standard registration sticker issued for 1952 . Trucks were an orange color. If one were to transfer to a new vehicle it was a bright red.